that adapts to your workflows and grows with your organization. Join the closed beta program and receive a permanent subscription discount. Ditch the paperwork and empower your organization. while you benefit from current records - all in one place. Members manage their own data, and you can create fields to collect exactly what you need. Filter users by field and see what is changing over time. Larger organizations have many roles. You can give specific permissions and roles to users who can help keep your data in line. If added to the beta program, you will be able to provide direct insight into what is working and what needs are not met, so Timber can be a better product for you. 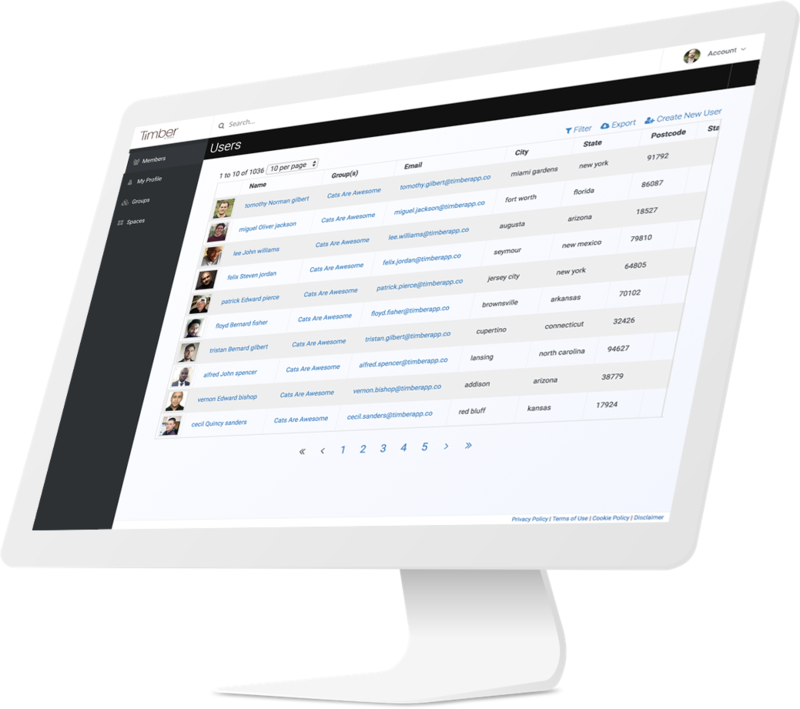 Smart Groups - Add and remove users to groups based on shared data, e.g. Alumni, Team Captains. Advanced Search - Look up any user or group by name. Exports & Notifications - Take your data with you when you need it, and receive updates as data becomes available. 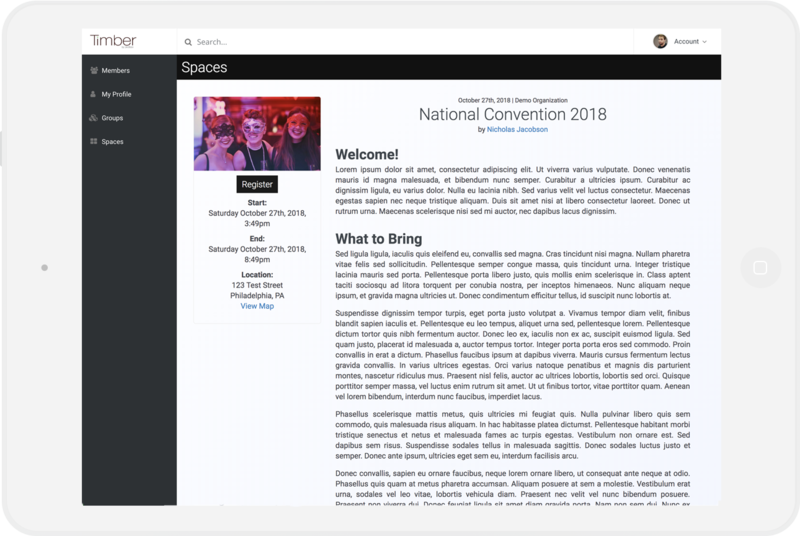 Spaces - From Topics (a chat/forum combo) to events and news posts, design a platform for internal communication and documentation that your members will love. White Labeling - Brand the platform with your logo, and even customize the domain. Timber provides the tools, you provide the branding. Coming Soon - Payments: Collect fees based on fields and time periods you define. No advertisers, no ad tracking. With encryption at rest and in transit, Timber is designed to be at the forefront of data storage best practices. 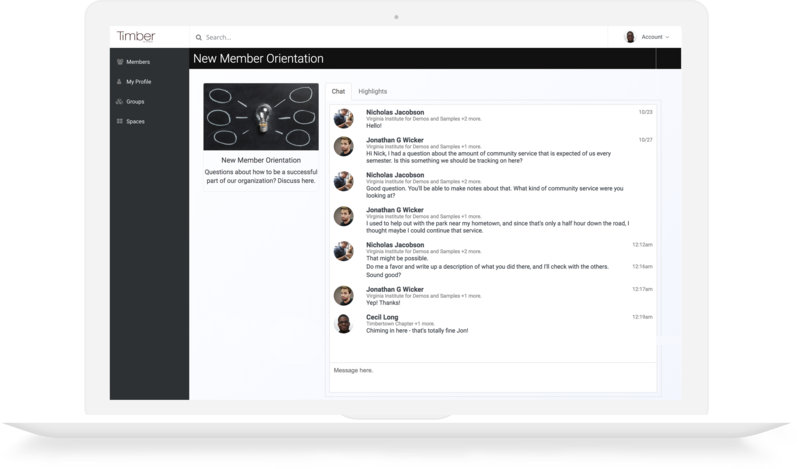 Members have their own login to a mobile and desktop-friendly platform, where they can participate in conversations, view groups, and make plans. Conference coming up? Fundraising event? Members can easily RSVP, and optionally pay for admission or other amenities like accomodations. With the ability to upload your own logo and future customizations planned, your brand remains at the forefront, while Timber keeps your platform running smoothly. Success and knowledge go together, so if you have questions about setup, features, or a good falafel shop in DC, just reach out.